6:20 PM — The Derek Jeter tickets sold for $81, thus raising $81 for High Socks For Hope. Awesome. 5:50 PM — No real news to speak of downstairs. Tony Franklin, as expected, could not yet officially acknowledge that Derek Jeter would be joining the Thunder. In non-Jeter news, I spoke to Shaeffer Hall, who came into yesterday’s game in relief of Phil Hughes and pitched just two innings. He says he doesn’t plan on doing anything different with his side work inbetween this outing and his next, which will be a July 4th start. “It’s just business as usual,” Hall said. 3:15 PM — So, anything going on? Ha, yes…it sounds like Derek Jeter will be here on Saturday and Sunday. There is nothing official yet from the Thunder, but just about every major New York media outlet is reporting that he’ll be here this weekend and will return to the Yankees on Monday. The Thunder will likely be able to make it official once Jeter gets through his Friday workout, I’m told. I’m also on Trentonian duty, so blog work will be lighter than usual for today…but I’ll have video and photos and Twitter updates as always. JN: Where is Adams in terms of coming back to this team? A: Adams is farther way. Adams will not come directly here anyway. He’ll probably go play in the Florida State League before he comes here. JN: Will that be a rehab, or will that be officially on Tampa’s roster? A: They don’t do minor league rehabs there, so he has to go on their roster. JN: Has the fact that he’s taken so long to come back been frustrating for you? A: It’s been frustrating for him. I empathize with him. One, he is a very good player and prospect. Two, he works beyond diligently at his craft defensively and offensively, and throughout this process at the rehab work that he faces. So he’s frustrated, but when you get down to it, what good does that do you? What he needs to do, and what he does do, is work at it every day. Humanness dictates that there’s some frustration, but he’s a smart enough guy to know that if you spend too much time on those feelings and emotions, it’s going to make your task even more difficult. A: Stoneburner’s pitching in games on a rehab assignment in the GCL. He’s got some more hoops to jump through. He had two innings in his last start. A: Bleich is a long way away. He’s not imminent. There’s no reason to worry about him. JN: I assume you were made aware of Slade Heathcott’s incident this year in Charleston. Was there any talk of possible internal discipline for his actions? A: There wasn’t any internal discipline. JN: When you see a kid who has Heathcott’s background, and this happens, does it worry you a little? A: He’s doing well at what he’s doing. I was no more worried about him than I would have been anyone else. He’s been great. We’ve had zero problems with him. MA: Betances and Banuelos are obviously the talk of the organization. How would you compare those two in terms of where they’re at right now? A: Very close. They’re both pitching well here. They could both pitch better here. They could both improve the control and command of their fastball, so they’re very close in my mind. MA: Is one ahead of the other? A: I don’t really think so. If there were, I wouldn’t say. JN: That third B, Brackman, are his issues mostly between the ears? A: He’s not doing well. He’s scuffling. I think it’s a confidence thing. More than anything else, it’s that. JN: What do you do to treat something like that? A: He’s working at it, and he’s got to work through the problems. When athletes struggle, the good ones, what they do is call on past successes and they run that video through their brain. Brack’s got to do that sort of thing. He’s got to remember how good a pitcher he is. At the end of the year last year, he was a good as anyone here. In the playoffs, a lot of our guys said he was our best pitcher in the playoffs. He can do that again. It’s been a tough year for him, but he’s certainly good enough and he’s certainly working at it. JN: Do you have a sports psychologist on staff to deal with such problems if need be? A: We’ve got a department of four people that deal with those issues specifically, but all of our coaches do too. It’s an ongoing conversation. What can we do to help our players max out their performance potential? Coaches and sports performance experts – I mean, coaches are performance experts – our coaches understand these things, our sports performance department understands these things. We try to educate players about how to think and feel during competition, during preparation for competition. It’s constant. All those things are intertwined. They don’t exist independently of each other. We understand that we need a program in those three areas for all of our players. Depending on the individual and depending on where you are in this guy’s career, one of those things may be predominant. Brack right now is working on confidence. It’s what he’s got to do. It’s taken a couple of hits, his confidence has, but this is a game for tough people. When I say tough people, it’s not just run over catchers, or break up double plays or run into walls to catch fly balls. A lot of the toughness required in this business is mental. It’s the ability to fight through junk. That’s where he’s at. He’s in a tough spot, we’ve got other players who have been in tough spots too. MA: Wanted to ask you about the hitting coach situation. Ever since Matos left, I guess things have been in flux a little bit. When the situation happened, what was your reaction? A: My initial reaction was just to find out went on. After that, you gather facts and you make judgments. As a result of that, we decided that it wasn’t going to work to have him here for the remainder of the season. We’re lucky we’ve got James Rowson, who’s going to spend a ton of his time here. James is an excellent hitting coach, and Pat Roessler’s our farm director. He’s a former major league hitting coach and hitting coordinator, and he’s exceptional too. So these guys will be in good hands. MA: What is Matos’ status in the organization right now? A: He’s still a member of the organization, he’s just not here right now. JN: What was behind the decision to keep Cito Culver at Staten Island this year rather than move him to Charleston with Gary Sanchez? A: Different player, different needs. Sanchez was probably the premier performer in the Gulf Coast League a year ago. Cito did a solid job. That’s all it is. MA: Is there anybody here knocking on the door of Scranton? A: Not right at the moment. Everybody expects Manny and Dellin to go, and they’ll go when they’re consistent, when they put together the kinds of performances we’re looking for. That doesn’t necessarily mean shutouts. It means when they continue to execute. Austin Romine could play at any Triple-A field in the country and be at home, but that’s just a matter of he and Montero need to catch. JN: With Montero, the word complacency has been thrown around. Is that something you’ve seen? A: No. I see him work every day. I see his defense improve. I think his defense has improved significantly over a year ago, and I think he continues to take steps in the right direction. He’s not putting up the offensive numbers he did last year, but last year his offense came in the last two months, two and a half months, and that’s where we are now. JN: Are you surprised it took him that long to turn it on in Triple-A last year? A: He’s 21 years old. He’d be a college senior. I’m surprised he’s in Triple-A, and that he’s working on his second year in Triple-A. MA: People talk a lot about the Hughes Rules, the Joba Rules, all that kind of stuff. When you see some of your younger guys break down a little bit like they have, not that I’m at all suggesting anything wrong is going on, do you second guess the way you’re progressing these guys along in terms of pitch counts, innings, stuff like that? A: Second guess how? Should have pitched them more, should have pitched them less? MA: In any sort of sense. A: No. I’ve done this too long and seen too many injuries. When we go through last year and have basically no injuries, and I tell our young guys — they think, for a fleeting moment characterized by a lack of humility, that we’ve figured out how to keep pitchers healthy – you’re always going to deal with pitchers injuries. There are three things that you can control: Mechanics, conditioning and workload. You cannot control DNA, and you cannot control the fact that the human body is not designed to do this. So, our pitching coaches try to help guys develop deliveries that are going to help them sustain. Our strength and conditioning coaches get involved in arm exercise, cardio, core, flexibility exercises designed to help these guys sustain. The programs are designed in conjunction with the best doctors and physical therapists in the country, the Andrewses and the extraordinary orthopedic surgeons who do so many of these things. That’s a lot of information, and no one’s got answers. Every once in a while, some club will start talking about this or that program they have – tread lightly. As soon as you think you’ve got the answer – as they say in golf, as soon as you think you’ve got the key they change the lock. I’ve done this long enough – as a lot of us have here – to have a healthy amount of humility about how hard this stuff is. We monitor pitches, innings, increases, workloads, times a year, long-throwing programs, core exercises, when they do their arm exercises, how many times during the week, how many reps … no detail is beyond our concern. Having said that, we don’t control the whole environment. JN: You mentioned DNA. While you obviously can’t look at DNA itself, can you go back and look at a guy’s family history to see if there’s anything there? A: If they had a mother and a father who were pitchers that pitched 300 innings a year for 20 years like Nolan Ryan, you’d probably say: Well, there’s a shot. Beyond that, you look for bigger and stronger, but jeez, who’s bigger and stronger than Grant Duff? Tim Norton, who’s bigger and stronger than him? They work very hard. Stuff happens. If we used them four days in a row, if the starter went 160 (pitches) because we were trying to win a playoff game, then we should be rightly scrutinized. Our primary objective is to produce and get these guys ready to play, and sometimes they get hurt. This year, we’ve had more than our share, as has our big league staff. JN: Staying on medical for a little bit, Alan Horne had platelet-rich plasma therapy. Was he the first in the organization to have that procedure done? A: No. We’ve used it for knees, hamstrings … it’s kind of en vogue now. We’ll know in a couple of years how good it is. JN: Which gets to the point of the question: What is the organization’s approach to newer medical procedures? A: Our doctors are doing it. I’m not doing it. Casey Stengel once said about a player “his limits are limitless.” My limits in the medical field are limitless. I don’t know, but our Dr. Ahmad, in New York, (and others like him), they have the current research. We defer. JN: Corban Joseph has really done well this year. What are your guys in the organization saying about the returns on him this season? A: Well. We love his bat. He works very hard at defense. He had a really great double play turn the other day in New Britain. First and third, one out – it was a heck of a play. He’s done well. JN: Same kind of question with Jose Pirela. First two months were bad, but now he’s turned it on. What do you think caused that turnaround? A: Look at his month to months last year – same thing. He told me it was weather. First two months, he’s never played in cold weather, he’s from Venezuela. I said, well what happened the first two months of last year, in Tampa? It was the same thing. Not sure he could play in the league? I don’t know. That’s rank amateur psychology. He hit a long home run to left-center in New Britain, I mean it was a bomb. 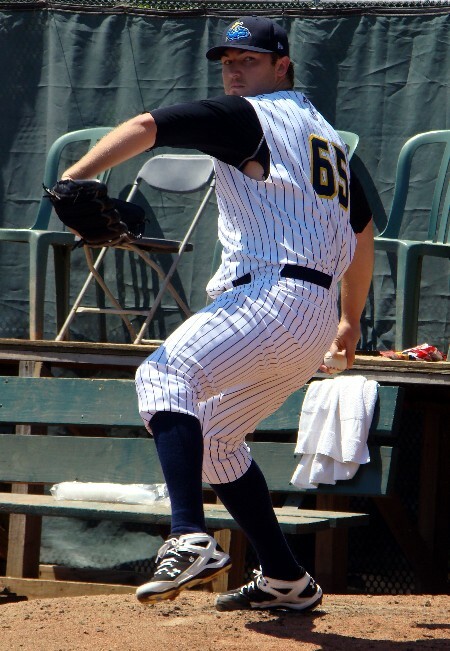 I just listed two lower level seats behind the plate for Derek Jeter’s potential rehab in Trenton on Saturday. All proceeds will benefit David Robertson’s High Socks For Hope charity, which will benefit those affected by the tornadoes in the former Thunder pitcher’s hometown of Tuscaloosa, Alabama. The link is here. Bid early, bid often, all that good stuff. According to multiple New York reporters, but first Tweeted by The Star-Ledger’s Marc Carig, Yankees GM Brian Cashman has told the media that if shortstop Derek Jeter is ready to rehab by Saturday, he’ll be headed to Trenton. Trenton is slated to host Altoona at 7:05 PM that night. No immediate word on if multiple games would be needed. — Again, a lot to get to and not a lot of time to do it, as I’m writing this from the Somerset Patriots press box. Yep, two games one day. Thanks to Phil Hughes for getting us out of Trenton in a sporty two hours and 15 minutes. — Usually this is where I’d give you the whole rundown of how Hughes did and what he had to say, but you can watch every pitch of his outing and hear every word of his post-game press conference with reporters in videos that are posted below this. I think it’s fairly obvious that he’s big league ready, but he also needs to get a little more stretched out, and I’d anticipate one more start in which he gets up to 100 pitches before he goes back to the Bronx. Would be hard not to think he’s going to Scranton. — In all honesty, I couldn’t tell you much about the non-Hughes stuff in the game. So much of the focus was there, as I think it’s expected to be, so I’d more or less be pulling any intelligent comments out of my rear end. And nobody wants that. 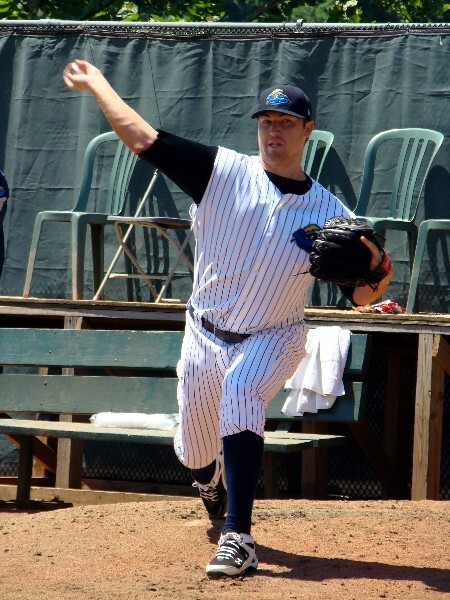 — Austin Romine, Corban Joseph, Manny Banuelos and Dellin Betances will be representing the Thunder in the 2011 Eastern League All-Star Game. 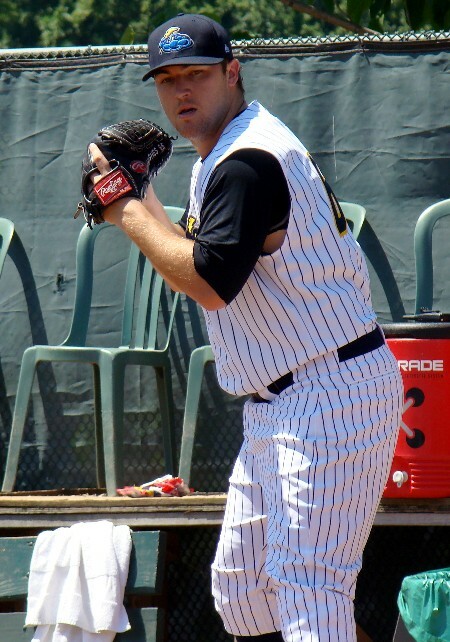 This is Romine’s second consecutive ELASG appearance, as well as his second straight Futures Game appearance. I’m a little surprised Ray Kruml didn’t get the nod as well. — I’ll be curious to see if the rotation gets rearranged since Shaeffer Hall only got two innings today, or if he’ll get his extra work in with a longer throw day session. Cory Arbiso came in to replace Hughes in the 7th presumably because they didn’t want Hall coming into the game in the middle of an inning, which he obviously isn’t used to. 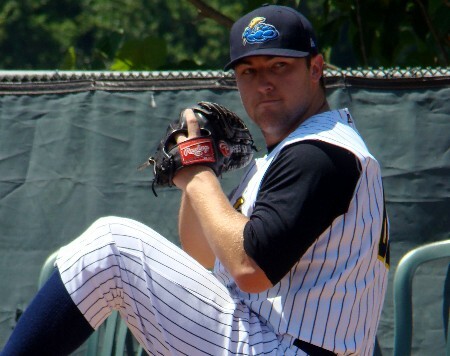 — Addison Maruszak, who was promoted to Triple-A Scranton today, was still with the team prior to the game but was not in uniform. FIRST INNING: 12 pitches/10 strikes. 94 MPH fastball. 1-2-3 inning, with a K at the end. SECOND INNING: 13 pitches/ 10 strikes. Fastball sitting 92-94. Two K’s. THIRD INNING: 7 pitches/6 strikes. 32/26 total. Four K’s total now. FOURTH INNING: 7 pitches/6 strikes. 39/32 total. Five K’s, but Anthony Gose broke up the perfect-o with a one-out single up the right side. FIFTH INNING: 15 pitches/9 strikes. 54/41 total…Six K’s, now a walk and two hits allowed. SIXTH INNING: 19 pitches/12 strikes. 73/53 total. Eight K’s now. Kid is rolling. SEVENTH INNING: 15 pitches/8 strikes in three batters faced. 88/61 TOTAL. He issued one walk and allowed one hit that inning. Cory Arbiso in. 11:10 AM — Also, the Thunder are testing a new live video feed…it is, as I said, still in the test stages. You can access it here. 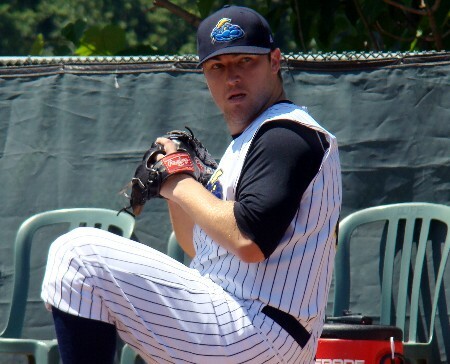 Addison Maruszak has been promoted to Scranton to make room for Melky Mesa. No real news as of yet, still waiting for the roster move to get Melky Mesa on, assuming he does actually get activated today.